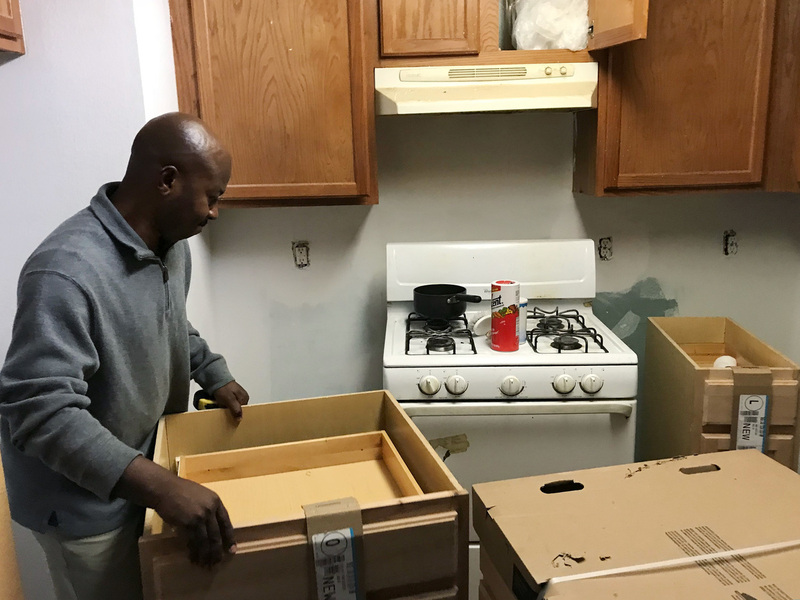 In Post-Harvey Houston, Immigrants Struggle As The City Grapples With How To Help An immigrant family from the Democratic Republic of the Congo lost everything in Hurricane Harvey. They hope to move back to their house in time for Christmas. "It was really scary situation. ... the water was coming in from the front yard, from the back yard, flooding everywhere. We had to act immediately," Tosha Atibu says. They grabbed what they could — a few documents — and went onto the roof. They tried to phone for help, but couldn't reach the overwhelmed authorities. So the family waded into the water in search of safety. Now three months later, and the Atibus are living in two motel rooms. The children — Germaine, Sarafina, Joshua and Etienne — were just about to head off to school when NPR's Weekend Edition stopped by. Their room has the semi-controlled chaos of three teenagers and one 6-year-old sharing the same space. Atibu Ty Ty works to get his home in shape in time for the family to move back in for Christmas. "I just miss the fact that I can't sleep at home — I wish I could go back, but there's a lot of work at home. We'll have to wait to finish the work so we can go back," says Germain, 17, the eldest. Seraphina, 13, says it's been hard to study with hardly any privacy. Etienne says he's been sleeping badly. "We feel sleepy. Sometimes we don't concentrate in class," he says. Things are tough all around. Tosha and Atibu Ty Ty tell NPR the loss of their home has been a devastating blow for the family, who arrived in the U.S. in 2009 as refugees from Goma, in the Democratic Republic of the Congo. It's not the first home they've lost their home to a natural disaster. More than a decade ago, they lost their house in the DRC in a volcanic eruption. Atibu Ty Ty, who was a civil servant, later became a political prisoner. After his release, the family escaped to Kenya, where they spent years in a refugee camp. And then, Tosha says, they were told they were going to a city called Houston in the United States. They didn't know where it was. "We were like, 'Oh, wow this must be a good opportunity! This is good.' At least we were going somewhere away from the refugee camp. We were excited, actually." Houston has become the most diverse city in the country through migrations similar to the Atibus family's. The city is one of the biggest centers for refugee resettlement in America. That's meant that people coming from almost anywhere in the world can find a community in the city that will help them get ahead. Tosha and Atibu Ty Ty were able to get jobs pretty quickly. They became active in a Congolese church. And then in 2012, they got a house through Habitat for Humanity. Life in their new city was good. "As a family, I was really wishing one day to be in a big house with my kids having enough space and having a good environment. You know? It was really a good experience. We really liked the house. ...We felt relieved, we felt settled and we felt comfortable," Tosha says. Things are looking very different post-Harvey. Tosha is unemployed. Her husband lost his car in the flood, so he can't make money as an Uber driver. They are using FEMA aid for repairs and to pay for their motel rooms. Houston is grappling with how to help thousands of people who, like the Atibus family, are still struggling. A new survey from the Kaiser Family Foundation found that nearly half the people affected by Harvey haven't received the help they need. 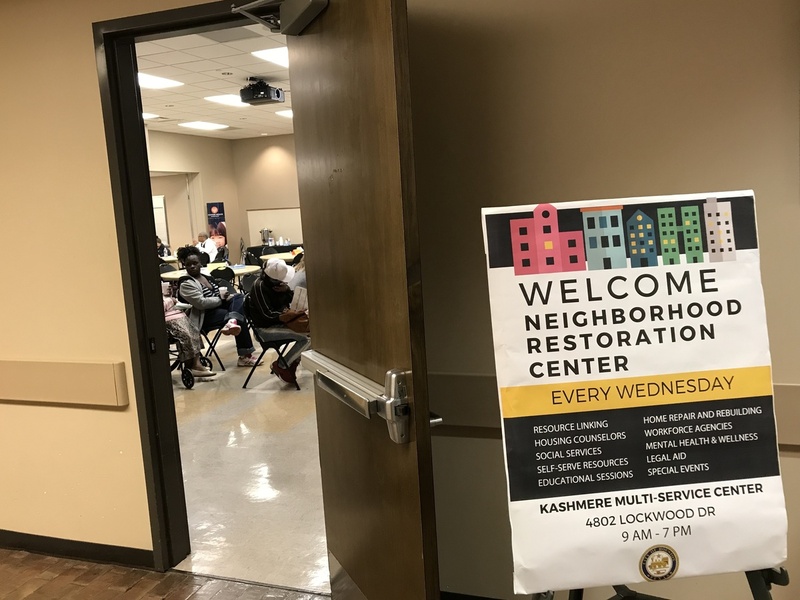 The city says the plan is to open 20 "neighborhood resource centers" to focus on recovery at the hyper-local level. Marvin Odum has been tasked with overseeing Harvey recovery for the whole city. He says these centers have been launched with immigrant populations in mind. "The very fact that the recovery has been designed neighborhood by neighborhood is based on us wanting to watch out for that very important characteristic of Houston. Houston is the most diverse city in the U.S. How do we preserve that? That's why we mention getting people back in their homes, in the same neighborhoods, the same schools and going to the same businesses," Odem said. The first — and so far only — resource center opened four weeks ago. NPR visited last Wednesday. It was crowded with people waiting for help. The idea behind the center is one-stop shopping. Everyone who comes is assigned a case manager and there are many booths with staff who can deal with a variety of issues, in a variety of languages. Donna Travis, a division manager with the Houston Health Department, is helping oversee this operation. She says low-income populations, including many immigrants, are the most vulnerable when disaster strikes. "What we're seeing in that particular population is that it's more difficult to rise above the impacts of the storm. They may not have the funds to move past this as someone who does have the funds. It's like, what do you do? You have to start from scratch again, and for the vulnerable populations, low-income populations, that is very, very difficult," she said. The worry for immigrants is that post-Harvey hardships will disrupt the fabric of their communities, driving people away, making it harder for them to thrive in the city. Houston's population has been booming, says Stephen Klineberg, a professor of sociology at Rice University and the founder of the Kinder Institute for Urban Research, which does regular surveys of Houston. Almost all the growth has been pushed by the influx of African-Americans, Latinos and Asians. "This southern city, dominated for most of its history by white men, has become the most diverse in the nation," says Klineberg. They came here after the collapse of the oil boom in the 1980s. There was inexpensive housing, along with very good jobs for both high-skilled and low-skilled workers. The first of what Houston hopes will be around 20 Neighborhood Recovery Centers where Hurricane Harvey victims can come for one-top shopping to help solve their post-Harvey problems. Klineberg says the more immigrants come, the more it attracts others from those communities. Where goes Houston, he says, so goes America. "The census tells us all America will look like Houston looks today, in 25 years," Klineberg said. In Houston today, 78 languages are spoken in the public schools, and surveys show the residents of the city have embraced the increasing diversity. The Atibu family is part of that story. Tosha and Atibu Ty Ty took NPR to their home, which they are now in the final stages of repairing. The walls are painted. On our visit, they are dragging in newly bought kitchen cabinets. They initially hired contractors to do some of the work, but the FEMA funds weren't enough. So now they're both pitching in to finish up the rest. The house is empty, and they don't know how they will afford new furniture. But that hasn't stopped them. In a life marked by many setbacks, they are still dreaming of a better future. They are rushing to get everything ready for the kids for Christmas, so Tosha can cook their traditional meal of sombe, a Congolese dish made with ground cassava leaves. "You know, as a family, we would like to be together and celebrate together and have fun together being in our house" this Christmas, Tosha says. 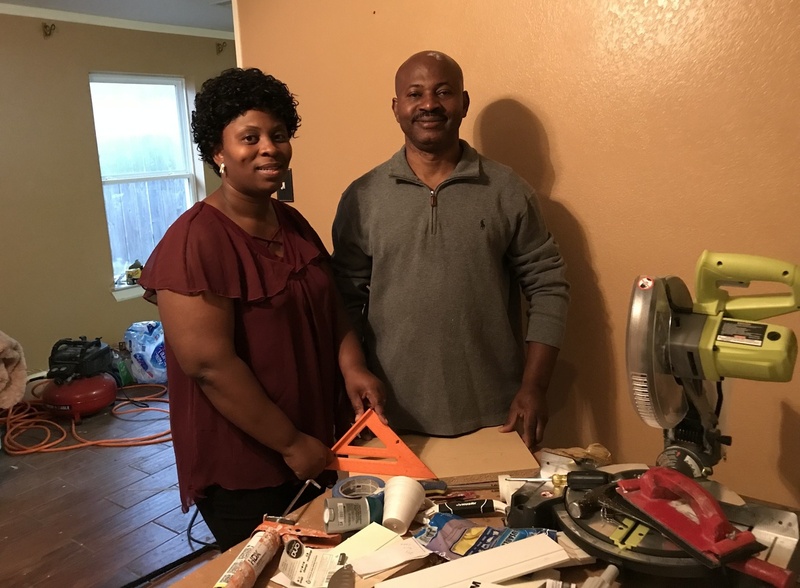 Like the many immigrants who have come before them, even after Harvey, Tosha and Atibu Ty Ty say that Houston is home now, and they have no plans to leave.